With the 2018 Oscar nominations announced on Tuesday, we have kicked our drive to watch the nominated films into overdrive. Friday night, we watched Mudbound. The film received four nominations: Best Supporting Actress and Best Original Song for Mary J. Blige; Best Adapted Screenplay, and Best Cinematography [the first woman ever nominated in the category]. 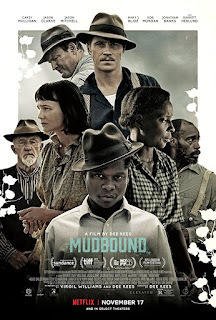 Mudbound is a 2017 American period drama film directed by Dee Rees and written by Rees and Virgil Williams. It is based on the novel of the same name by Hillary Jordan. It stars Carey Mulligan, Garrett Hedlund, Jason Clarke, Jason Mitchell, and Mary J. Blige. The film depicts two World War II veterans – one white, one black – who return to rural Mississippi each to address racism and PTSD in his own way. Mudbound is a solid movie. It exceeded my expectations. I am frankly surprised that Mary Blige was nominated for supporting actress. Her screen is fairly limited and the performance is nothing special. I was more impressed with Holly Hunter's performance in The Big Sick.